CKUT’s Stefan Christoff recently wrote an article entitled “Trudeau embraces injustice, in Gaza and Canada” in which he calls out Justin Trudeau for not speaking out against Israeli war crimes in Gaza. He also critiques Trudeau for speaking in favour of expanding the Canadian military, and his support for the Keystone XL pipeline, which reveal that Trudeau’s politics are, after all, not a real political alternative to Stephen Harper and the conservative party. 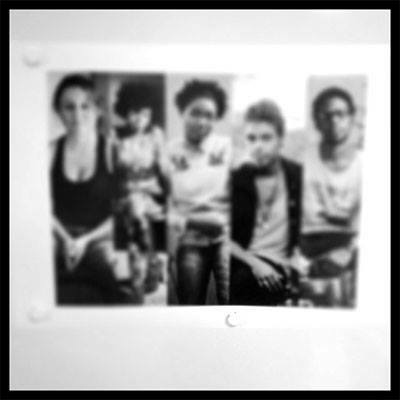 He joined us on the Tuesday edition of the Off the Hour program to talk about his article. Open Letter to the CBC Radio-Canada Ombudsman. Mainstream media in Canada claims to provide a neutral stance when reporting on issues related to Palestine. Being neutral means reporting on facts and providing proportional coverage of those facts. On July 19th, Radio-Canada, Quebec’s largest French-speaking news outlet and a beneficiary of Canadian public funds, wrote a news article about a Montreal Palestinian solidarity demonstration that omitted important facts and misrepresented the events that occurred. The first thing you learn in journalism school about reporting on facts is to always report on the 5 W’s: Who? What? Where? When? Why? 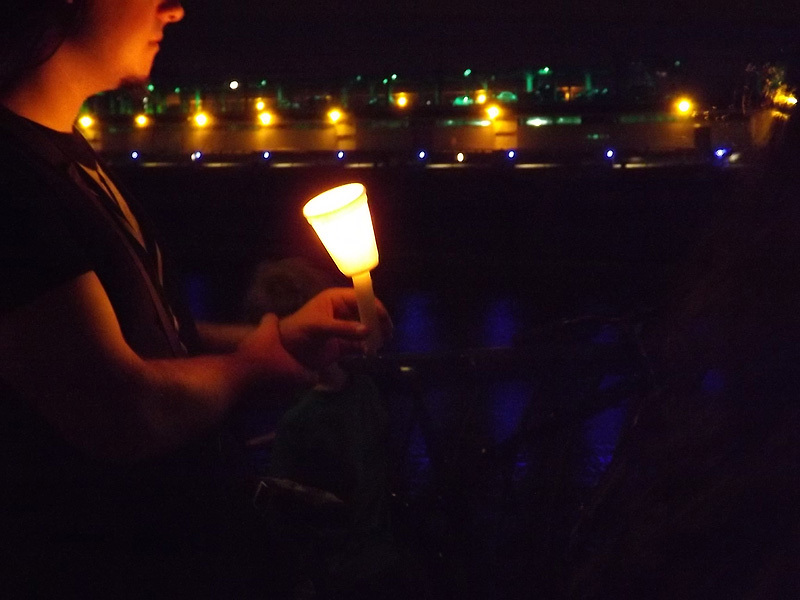 On July 25th , dozens of Montrealers met at night for a quiet vigil at the Montreal Old Port. 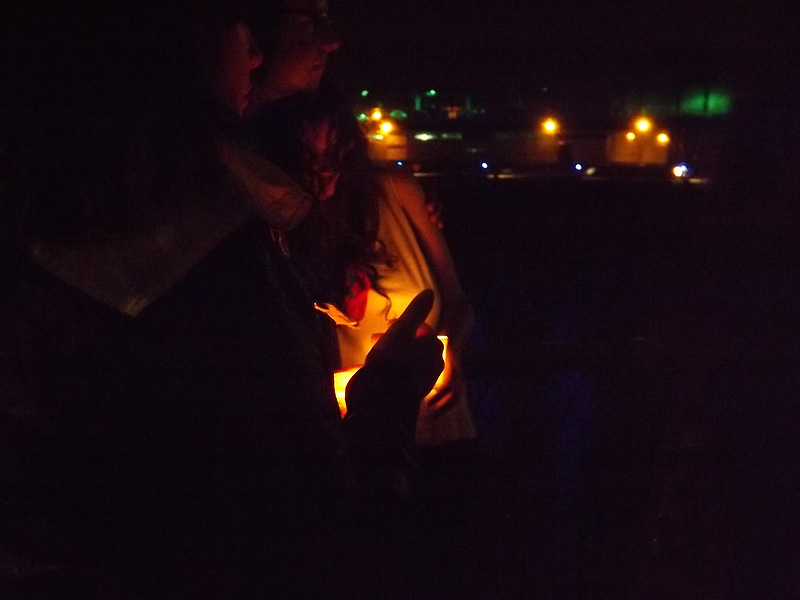 While overlooking the Saint-Laurent river, protesters lit candles and released sky lanterns in the memory of the hundreds of Palestinians who have died since July 8th. 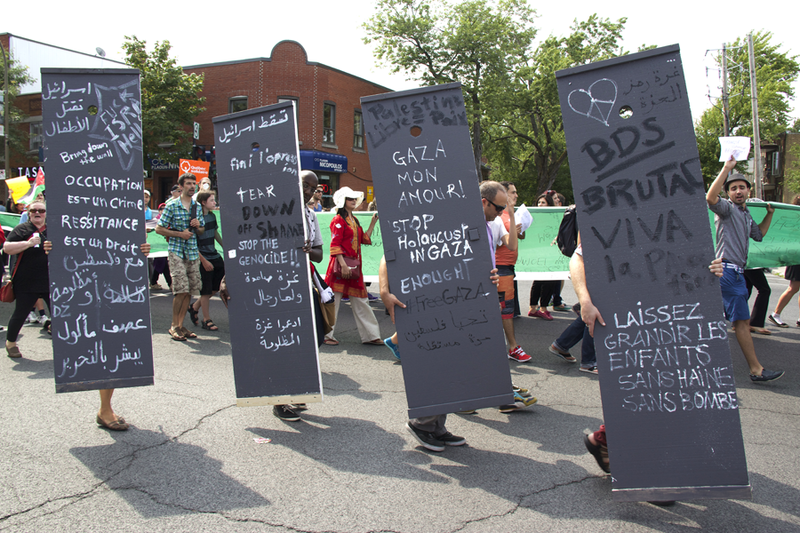 Mobilization in solidarity with Palestinians continues to intensify in Montreal, as Friday saw the 6th protest against Israel’s war on Gaza since the offensive began on July 8th. Hundreds of protesters have gathered in Montreal to demand an end to Israel’s deadly air and ground offensive in Gaza that has killed over 1,060 Palestinians and wounded over 6,000. Protesters are demanding an end to Israel’s colonial occupation of Palestine and are calling on the Canadian and Quebec governments to end their complicity with Israeli breaches of international law. 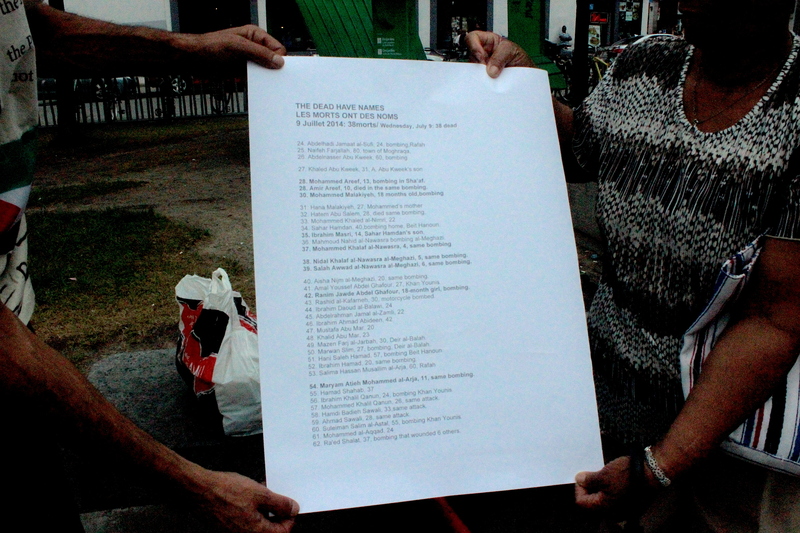 After the first protest took place on July 11th, hundreds of Montrealers gathered again on July 16th to march through the streets. Jasmin and Amal, two women from Gaza explained that “it’s just not fair what’s happening to the kids, to the women, to the men. I just want Canadians to step up and say it’s not ok, it’s not right what’s happening”. Since Israel’s “Operation Protective Edge” was launched on Gaza two weeks ago, a massive mobilization campaign has taken place worldwide to protest against Isreal’s aggression against Gazan civilians. Over 718 Gazans have been killed and over 3,750 injured since July 8th when Israel’s operation was launched. As Israeli bombs continue to drop on Gaza, Montrealers have been marching on the streets in solidarity with the Palestinian people. Bellow are photographs taken during July 23rd protest. Protesters holding the longest Palestinian flag in the world. Since Israel began its military assault on Gaza 2 weeks ago, Montrealers have been pouring into the streets to denounce Israel’s disregard for international law, its occupation of Palestinian land, and its apartheid system. Over 620 Gazans have been killed and over 3,750 injured since July 8th in what Israel is calling “Operation Protective Edge”. 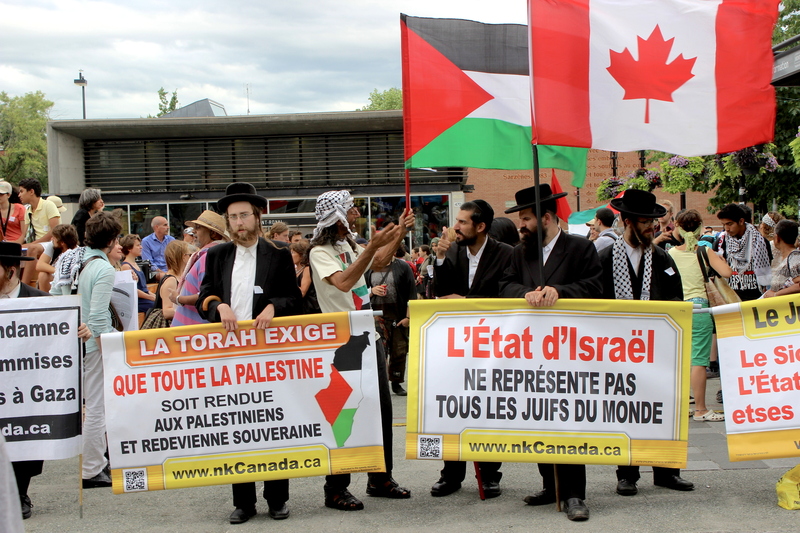 After Montreal’s protest of july 11th, Montrealers took again to the streets on July 16th and 19th to express their solidarity with the Palestinian people and demand the immediate end of this indiscriminate and deadly assault on Gaza. This report covers the last 2 protests. 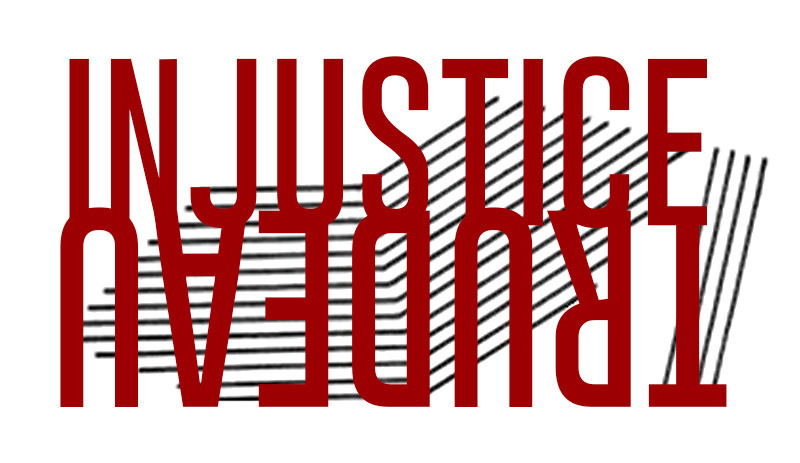 Under the Olive Tree is a Montreal-based community radio program in solidarity with Palestinians aired live every Thursday from 11am – 12 noon on CKUT 90.3 FM in Montreal and on CFRC 101.9FM in Kingston, Ontario from 4pm – 5pm.